Aaron Wildig could be fit to return for Morecambe at AFC Wimbledon. Morecambe boss Jim Bentley looks set to have a far healthier squad for the trip to AFC Wimbledon on Saturday. 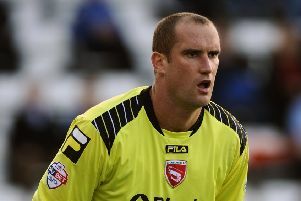 The Shrimps head to the Cherry Red Records Stadium having picked up impressive away wins at Bury and Carlisle United. The two fine victories have come without the injured Adam Dugdale, Laurence Wilson, Aaron Wildig and Andy Fleming however. Having featured regularly in the first couple of months of the season Dugdale’s recovery from an ankle injury, Wildig’s from a groin problem and Fleming’s from back trouble, are all progressing well. This weekend’s game could however come too soon for Wilson who limped off with a hamstring problem in the 0-0 draw at Oxford at the end of September. Bentley said: “We’re looking okay at the minute. “Having no game on Tuesday was a bit of a blessing. “It’s given time for the bumps and bruises to heal and the lads who’ve been injured are making good progress. “The likes of Wildig, Dugdale and Fleming have really stepped up. “We’ll still be struggling with Laurence Wilson but the rest are looking okay. Any returns will mean Bentley has the most common of managerial headaches, whether to change a winning team at Wimbledon on Saturday. One thing is for sure, The Shrimps boss is set to have a stronger bench having only named six substitutes at Carlisle on Saturday and have options ahead of another busy couple of weeks. He said: “The lads who’ve been playing have done themselves no harm. “They’ve been very good over the last two games. “We’re likely have some coming back and it will boost our numbers. “We were depleted on the bench last week only naming the six subs. “We’ve had the free week to work with some players but again we’re back into Saturday, Tuesday, Saturday.